It is well recognized that cancer cells often appear in an inappropriately differentiated stage, and the term “dedifferentiation” is often used.1, 2, 3, 4 Dedifferentiation is a prominent feature of cancer cells; however, the causative mechanism is not well understood. Even the meaning of “dedifferentiation” is not well defined and is often used to refer to various aspects of cell changes associated with neoplastic transformation. 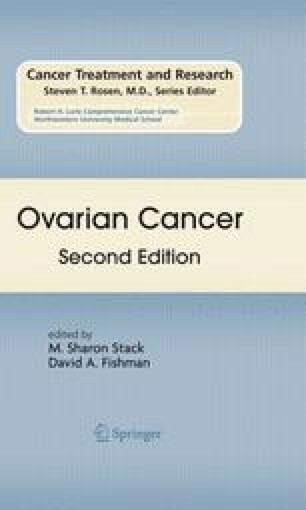 The phenotype of ovarian cancer described as “undifferentiated” or “dedifferentiated” often refers to the apparent changes of the cancer cells toward a less epithelial-like morphology. However, such a definition is subjective and lacks molecular determinants. We acknowledge the excellent technical assistance from Jennifer Smedberg and Malgorzata Rula in the laboratory research that produced the results cited in this chapter. We are grateful to the laboratory members for their suggestions, comments, and reading and editing during the course of the experiments and preparation of the manuscript. These studies were supported by funds from grants R01 CA095071, CA79716, and CA75389 to X.X. Xu from NCI, NIH.